Bring the milk, sugar and vanilla to the boil in a pan, stirring constantly. Pour the mixture into a stainless steel bowl and leave to cool. Carefully fold in the whipped cream using a rubber spatula. Cover and freeze for approx. 2 hrs., stirring 2-3 times. Place the chocolate in a thin-sided bowl and suspend over a gently simmering bain-marie, ensuring that the bowl does not touch the water. Melt the chocolate and stir until smooth. Mix the chocolate into the ice cream mixture using a fork, return to the freezer for approx. 1 hr. 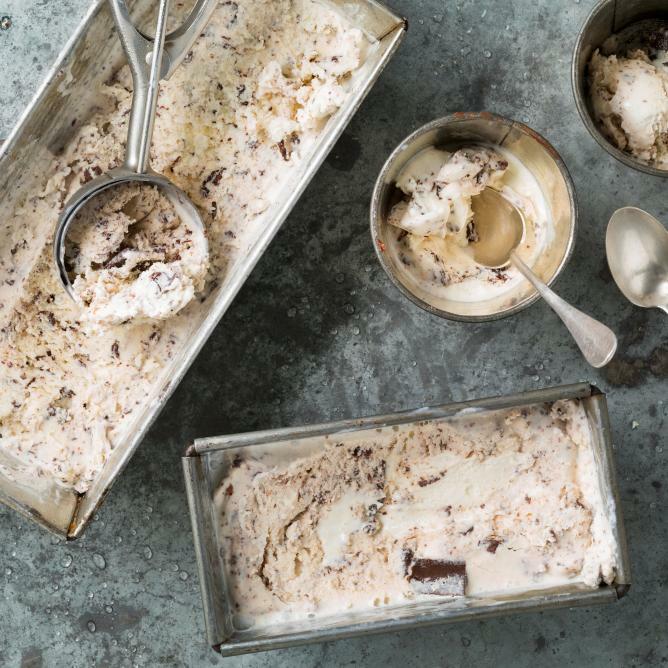 You can also use an ice cream maker for this recipe. Transfer the ice cream mixture to the ice cream maker and freeze for approx. 15 mins. Mix in the melted chocolate and freeze until ready.